Description: A multiformat audio player by Matthias Böcker. 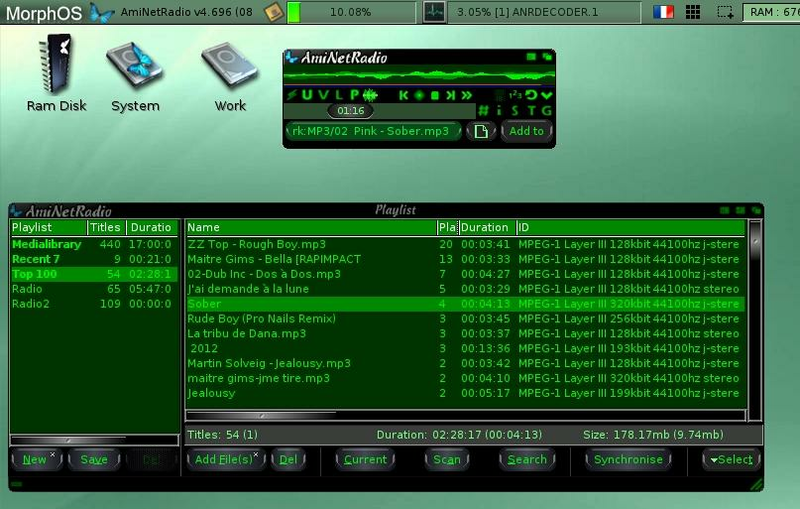 Short: AmiNetRadio, a multiformat audio player for Amiga. and you still had to surf the website for URLs, so we made our own player. - Load and playing of shoutcast streams with no locking, hanging or crashing! - An attractive, powerful and fully skinnable GUI with lots of nice effects! - Powerful and flexible shoutcast search tool. No need to waste time browsing! - Optional streaming to disk - save those favourite streams for later! - Attractive external and in-built scopes! - The ability to use AMPlifier and AmigaAMP scopes! - OpenURL support - visit the shoutcast stream's radio website in a click! - Paste URLs as IP addresses or DNS names! - Plays mp3 files from disk as well as internet streams (including .m3u and .pls)! - Fast and efficient - no 2MB exes or waiting ages for it to load! - Plays digital CDDA from CD through AHI! - Also plays protracker, AHX, Impulsetracker, soundmon and future composer modules! - New modular GUI format, can use classic ANR, ANR NG, MUI and WinAMP skins! - Uses xpk to unpack xpk packed files on the fly! - Modular player API allows ANR to play almost any music file conceivable - just add a player! - Now supports saver libraries to save streams in a variety of formats! 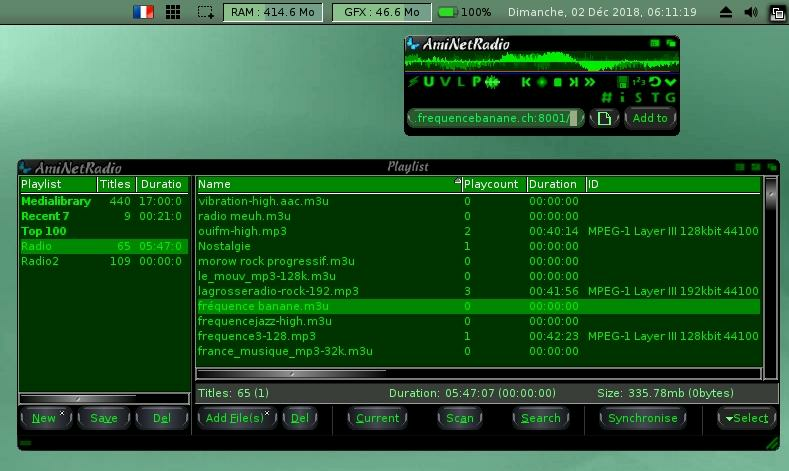 AmiNetRadio under any other AmigaOS-like operating system. figured out all the dirty details. figuring out a couple of problems and bugs in the player and plugin API's. With their help it was possible to make AmiNetRadio even more stable. that were played in the last 7 days. FutureComposer players and fixed many bugs and added a couple of features. CD's an even more enjoyable experience. players for Wave, AIFF and Sun Audio preinstalled. partly rewrote it to be in sync with this all new AmiNetRadio release. One last thank you has to go to Leif Salomonsson and his efforts with ECX. more MorphOS native and to make it an even more exciting experience. using this exciting and new AmiNetRadio installment. for it. Making a profit from this product is strictly prohibited! prevented from running on the said operating systems.